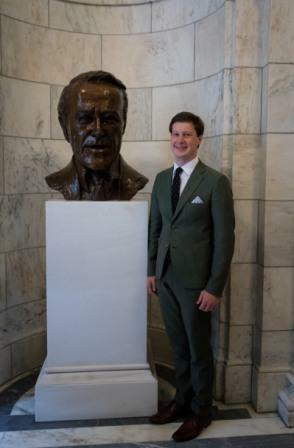 Andrew Lewis, one of the 2016 Jackson Leadership Fellows, chose for his project to analyze and write about an important Jackson achievement – the Land and Water Conservation Fund – addressing both its significance and its future funding and standing in Congress. 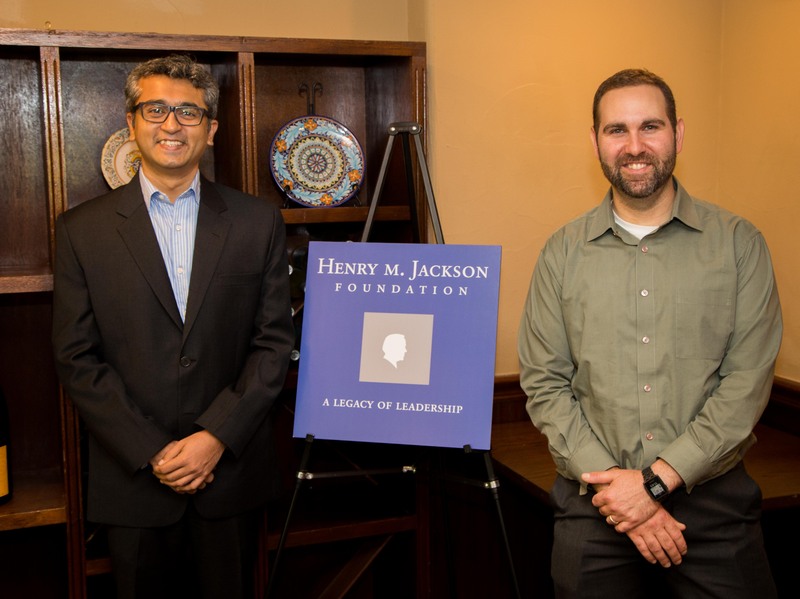 As a recent graduate from the UC Berkeley School of Law, Andrew felt naturally drawn to legislation close to the heart of the Jackson legacy. Andrew has always been heavily involved in Washington State politics – starting at the early age of 14 as an intern in Washington State Senator Patty Murray’s re-election in 1994! His legal interests include environmental law, so he was attracted to the battle over the Land and Water Conservation Fund’s future. Senator Jackson introduced the original Land and Water Conservation Fund (LWCF) Act at President John F. Kennedy’s request. For over 50 years, the Fund has contributed resources to parks, wild spaces, recreation areas, and the natural heritage of our country. A small portion of oil and gas royalties funds the LWCF, as Jackson intended it to do, making the funding source smart economic and environmental policy. Andrew’s paper, published in the Ecology Law Quarterly in spring 2016, explains the history of the LWCF and its purposes, namely “to preserve, develop and assure accessibility to outdoor recreation resources for the American people.” To do this, Congress authorized a $900 million annual appropriation to fund the LWCF. Historically, however, while the Fund has received resources, it has never received the full amount intended by the legislation. Andrew shows the LWCF’s success in driving conservation and economic growth despite its dwindling funding from Congress over the years. Most important, Andrew describes the current state of the LWCF as “tenuous.” Congress gave the Fund a temporary, three-year extension and an appropriation of $450 million. 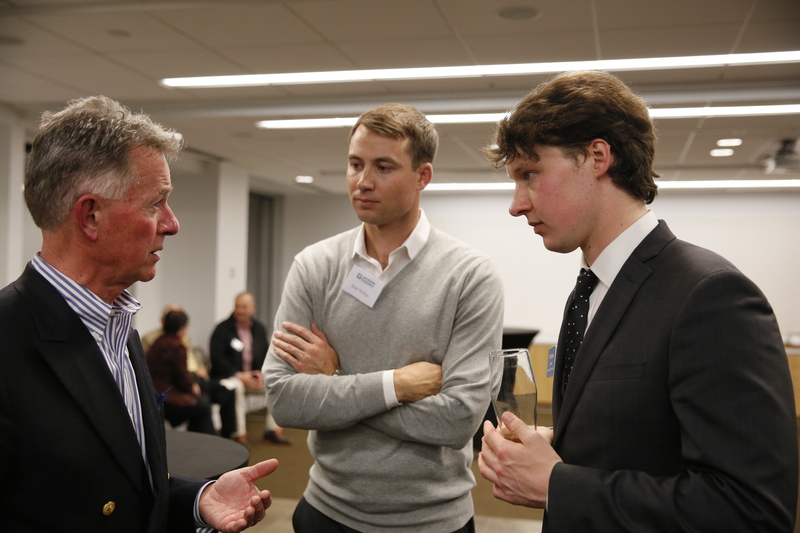 Foundation President John Hempelmann mentored Andrew and provided him with careful editing as well as a big-picture political perspective on the legislation. Both John and Andrew expressed relief that the Fund’s life has been extended, but they are concerned about its future. Andrew outlines options currently under discussion in Congress – led by Washington State leaders – that would provide permanent funding for the LWCF. The paper does an excellent job of clearly assessing the past and future prospects of this important piece of Jackson’s environmental legacy, and the protection of our nation’s natural resources. Bravo to Andrew for his excellent piece and for landing an article in a prestigious law journal – all while finishing law school. Talk about inspirational! I had the chance to sit in on part of the Center for Women and Democracy’s Leadership Institute, an annual short course for dynamic young leaders – all professional women from the region – that the Center conducts. 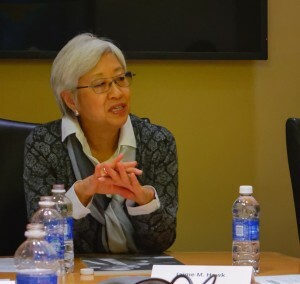 The participants are impressive: they range from graduate students in engineering or international studies to human rights activists, global health experts and philanthropic sector analysts. 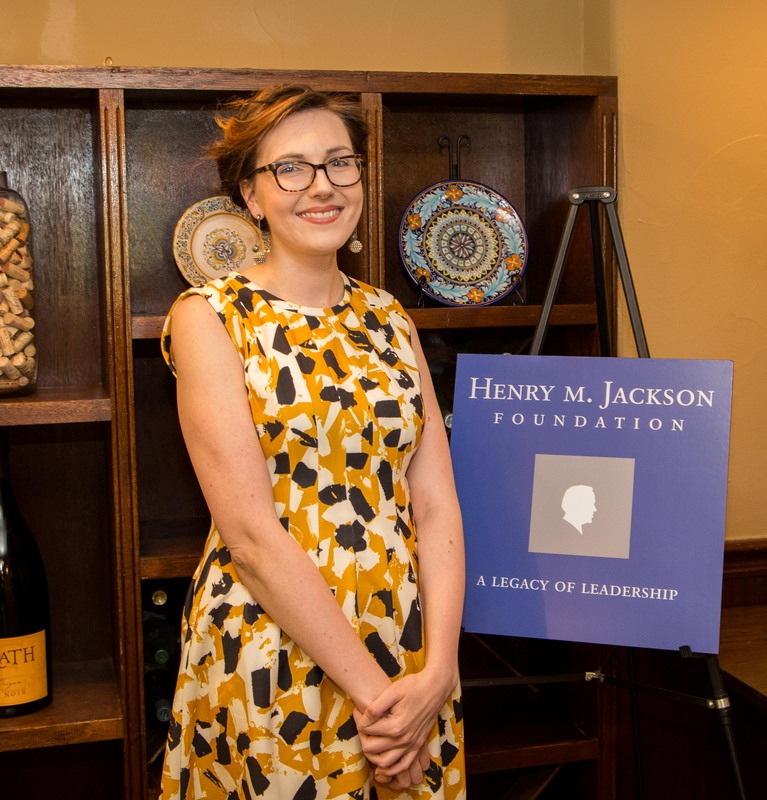 I was fortunate to speak briefly to the group about Senator Jackson because one of our own Jackson Leadership Fellows, Jaime Hawk, is a long-time board member of the Center and chose the Leadership Institute as the place to concentrate her individual project time for the Fellowship. Panelists, from left to right: Michelle Frix, Tamara Power-Drutis, Laura Stewart, and Jaime Hawk (2016 Jackson Fellows). 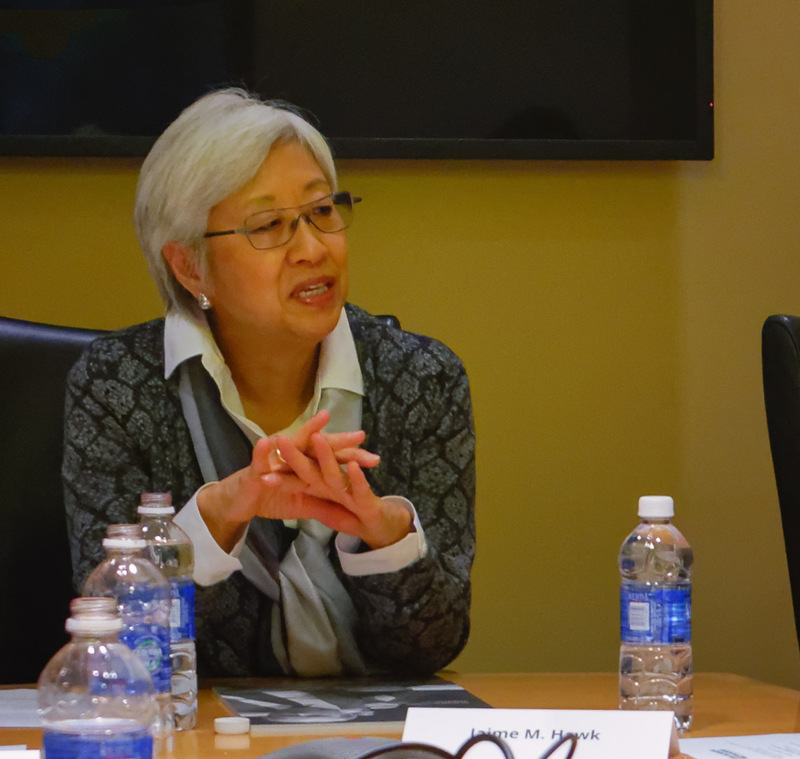 Using the Foundation’s Nature of Leadership publication, which focuses on the enduring Jackson values that we believe are widely applicable for new generations of leaders, Jaime pulled together a panel for the community engagement part of the Institute’s curriculum. 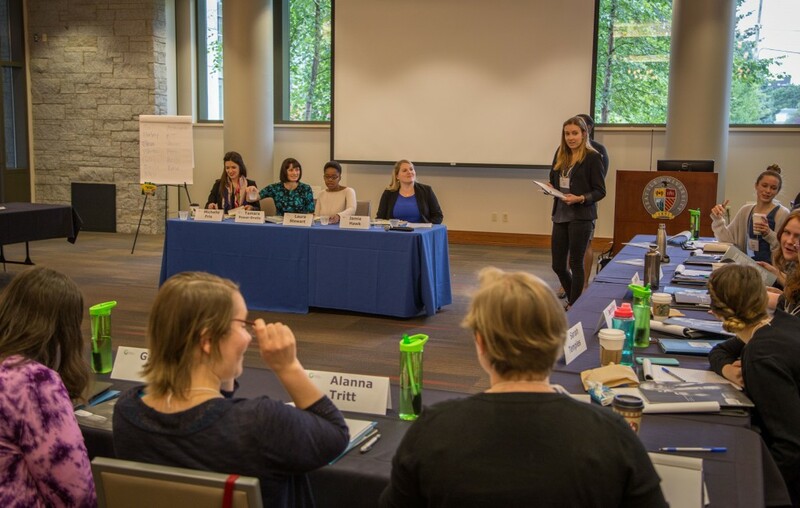 The panel, “Leadership for the Public Good,” featured Jaime in a conversation with a few of her compatriots from the Jackson Leadership Fellows program – Tamara Powers-Drutis, Laura Stewart, and Michelle Frix. All four Fellows have been working together to become more effective and successful leaders, and they discussed the influences on them – many pointing to their mothers as key – and the mentors and inspirations they have drawn upon. Framing the discussion around what motivated these successful women in their own lives and careers, Jaime elicited the passion that drives each of them on a daily basis. They shared reflections on their journey, how and why they chose public service, and the turning points that shaped their careers. As Jaime put it, working in the public sector is more about “finding the kind of job where I can be passionate about what I do – for my 60 hours a week!” Tamara agreed, saying that she also thought about “where are gaps that her passions can fill” in the sector as she pondered her own career path. Laura captivated the audience with her personal story of activism from her earliest days as a child in Swaziland, where she was drawn to environmental justice because of inequities around her, disproportionately hurting her community. 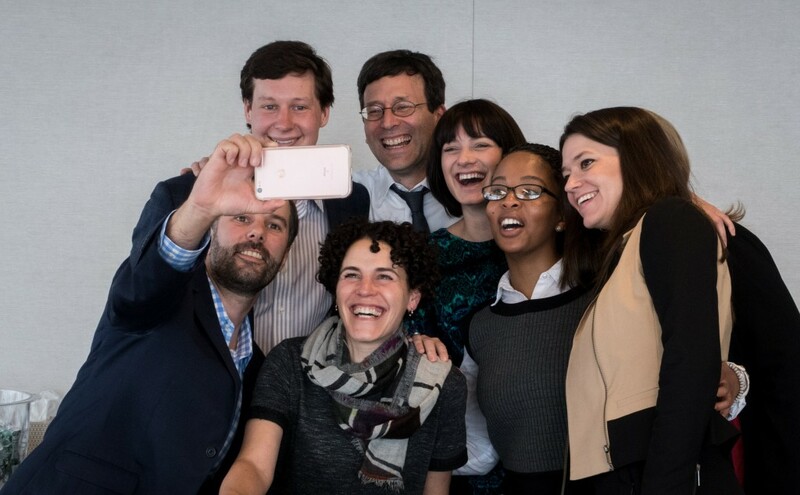 Michele, now Chief of Staff at the Seattle Foundation, spoke of her own journey, emphasizing her personal decision to “go deeper” into a field – rather than be a generalist – and her immersion in Latin America studies at the Jackson School as a vital first step on that road. 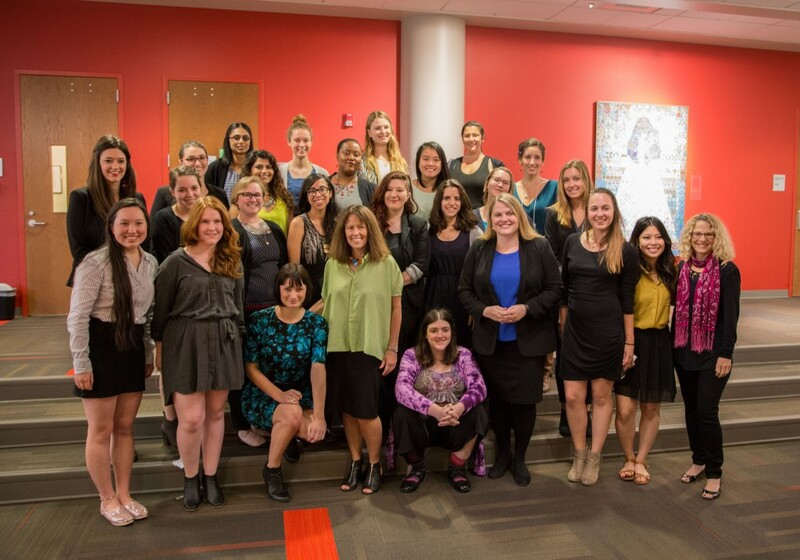 Linda Mason Wilgis (Foundation vice president) — front row, fourth from left —served as one of Jaime Hawk’s mentors in the Fellows program. She is shown with participants in the Leadership Institute. Tamara Power-Drutis, one of this year’s Jackson Leadership Fellows, chose for her individual project to create an ambitious media workshop for the community. 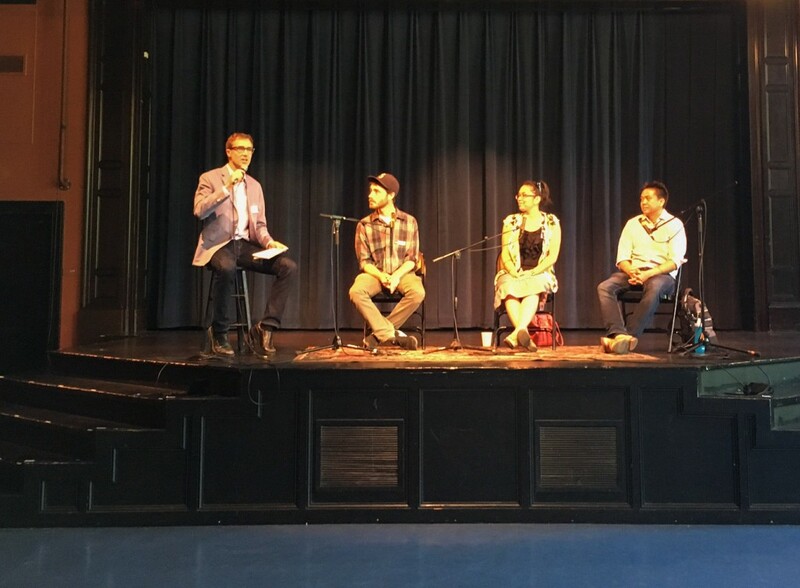 Entitled “Press for the People: A Grassroots Media Workshop,” the day-long event in early June was intended to help those who might have under represented voices in the Seattle media scene. 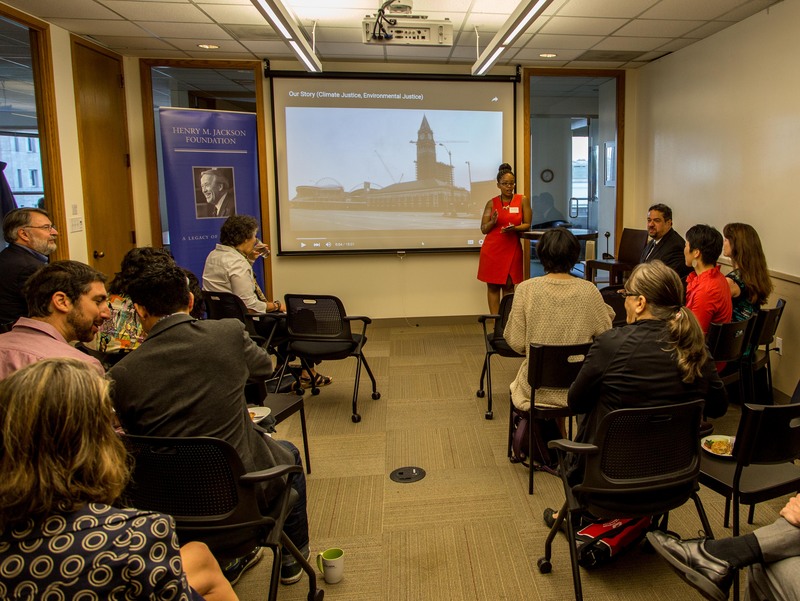 Sessions such as “Finding and Shaping Your Story,” “Video Storytelling Workshop” and “Photography Workshop” helped participants – who were all ages, colors, and backgrounds – tap into helpful tips from local experts and journalists. Tamara’s employer, Crosscut Public Media, was a key sponsor of the event, but Tamara signed on KCTS television, the Seattle Weekly, the Seattle Globalist, the International Examiner, South Seattle Emerald, and the Seattle Channel, as well as the Jackson Foundation, to be cosponsors of the event. Tamara’s goal in putting on the highly substantive event was to help members of the community learn how to generate stories, identify and interview sources, navigate local media, produce multi-media photo, audio and video stories, and connect with local editors to get to know them — and potentially pitch future story ideas. Professional journalists and media specialists donated their time to help train the participants. 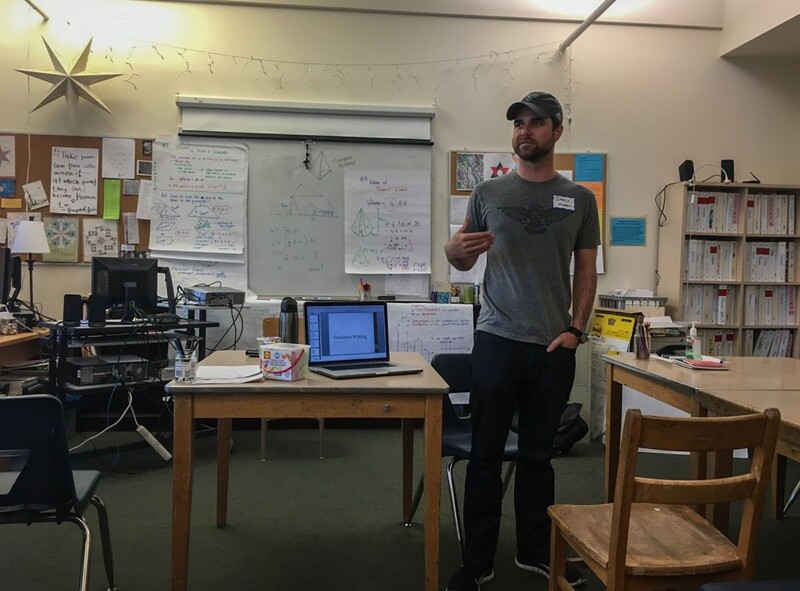 Community members were particularly pleased to have an opportunity to sit down with the local editors one on one to talk about how to get attention for their stories. It is always inspiring and somewhat humbling to meet the young graduate students who are benefiting from the Fellowships. They are an accomplished bunch, with many languages and research areas between them! Oded’s research focuses on the mobilization of irregular migrants such as guest workers, undocumented migrants, asylum seekers and refuges. His dissertation compares African migrants mobilizing in Israel with migrant movements in Washington State, so the Fellowship here has been a great fit. He is also deeply aware of the Jackson legacy in immigrant human rights, represented by the Jackson-Vanik Amendment and Jackson’s outspoken defense of the right to emigrate freely. 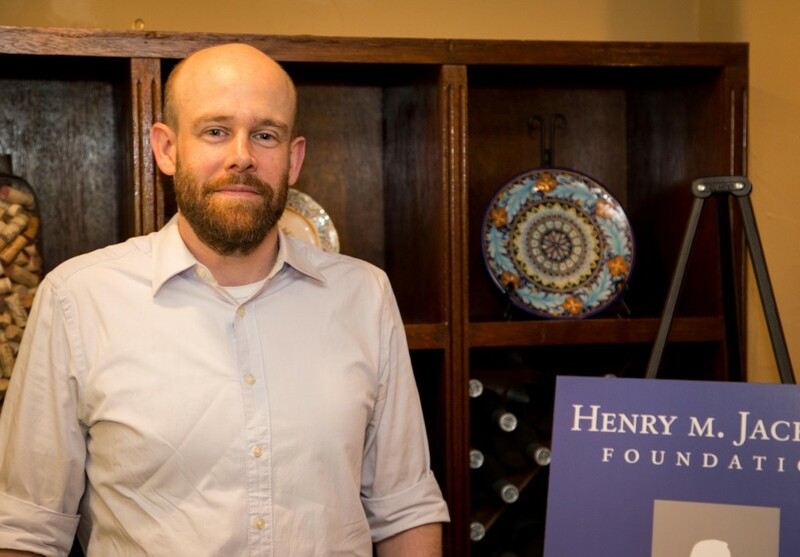 The Foundation also funds two Henry M. Jackson/Gordon Culp Fellows each year — one in Russian and East European Studies and one in China Studies at the School. 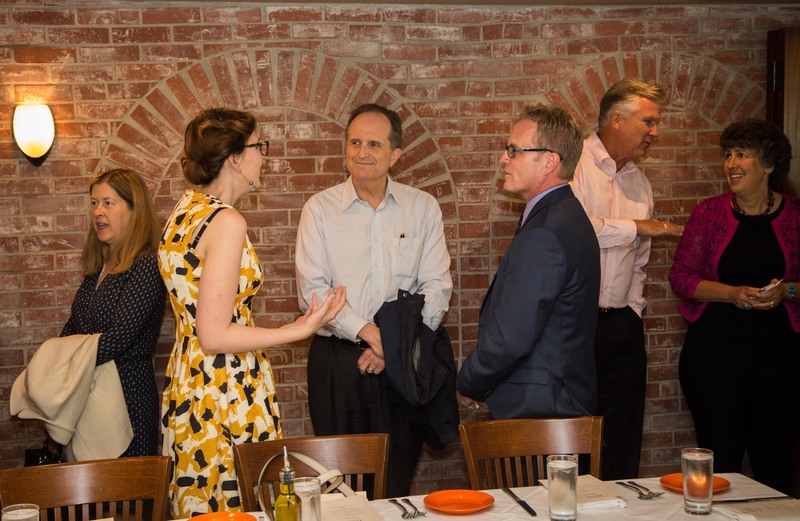 Ross Doll, the China Fellow, and Celia Anne Baker, the Russia Fellow, engaged the crowd as they talked about their work and the way that the Fellowship has helped them move forward professionally. These two fields have been integral to the history of the Jackson School and were a key reason that Senator Jackson worked hard to support the School and its students during his Senate years. The Foundation is proud to continue that tradition. 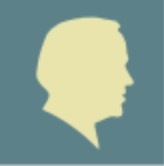 Senator Jackson believed deeply in the importance of good government. For him, that meant being prepared, well-informed, and ready to work with others – from either political party – to get major legislation passed. 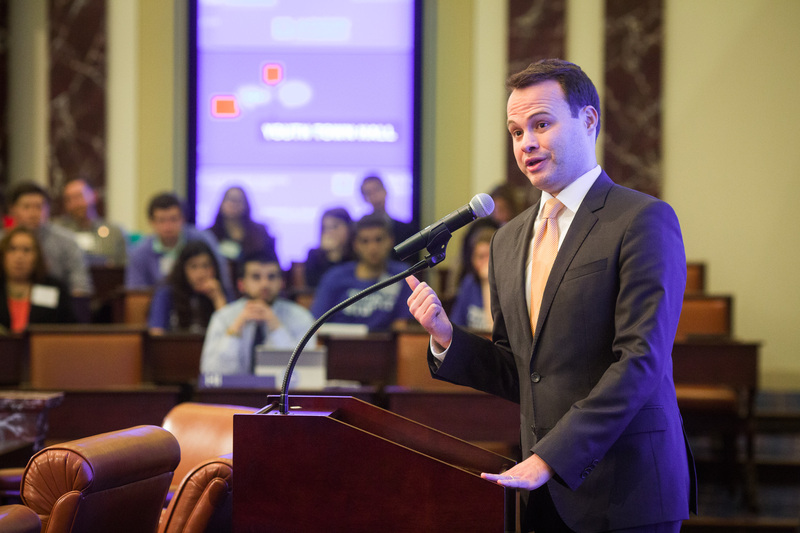 One part of the Foundation’s work is to encourage civic and political engagement, particularly among young people. 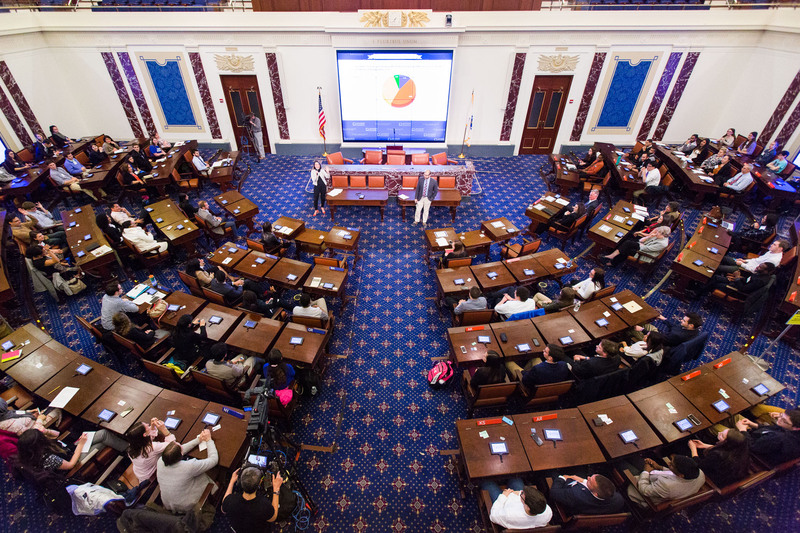 We recently found a new partner in the Edward M. Kennedy Institute for the U.S. Senate to do just that. 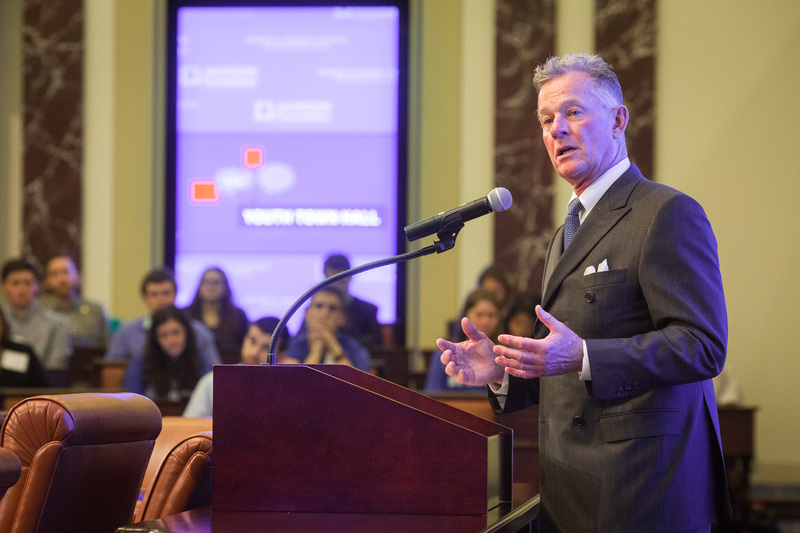 The Kennedy Institute, only a year old, and the Jackson Foundation, together sponsored a Youth Town Hall at the Institute’s home base in Boston, Massachusetts. The timing, in the midst of the 2016 presidential election, could not have been better and enthusiasm for the event was high. 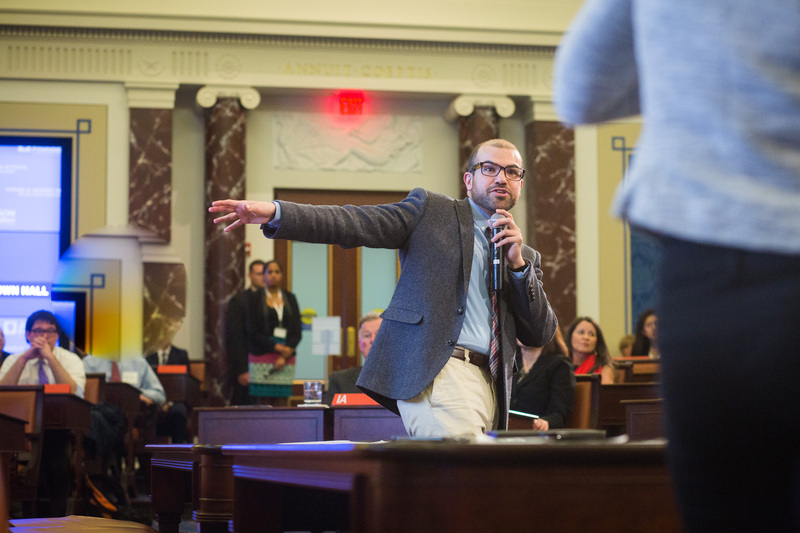 The Youth Town Hall had two excellent young moderators in Lauren Dezenski, from Politico, and Mike Deehan, of WGBH News. They deftly got the crowd to discuss the interactive survey of views of the political process – How can we get you more involved in political life? How likely are you to volunteer for a campaign? How important are the issues discussed in the presidential election to your life? Are the candidates talking about your issues? What can be improved in the civic education of our country? 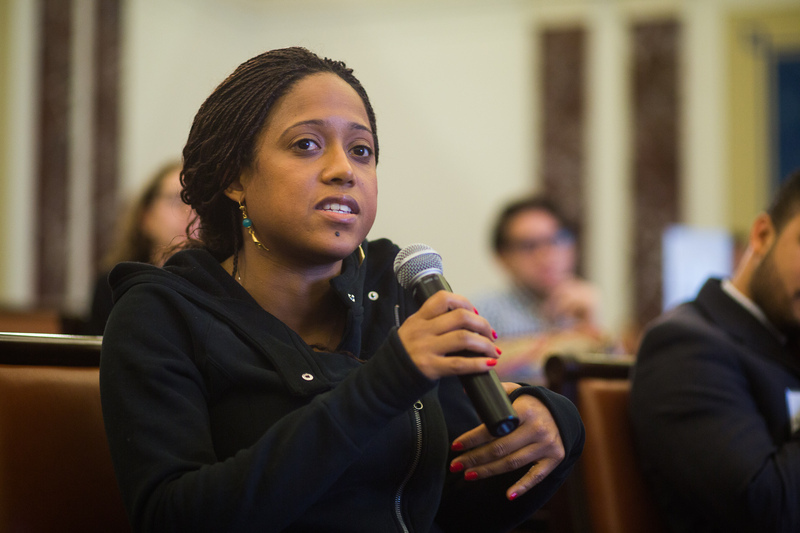 This was the first Youth Town Hall sponsored by the Kennedy Institute and the Jackson Foundation. It was inspiring and can be watched in full here. 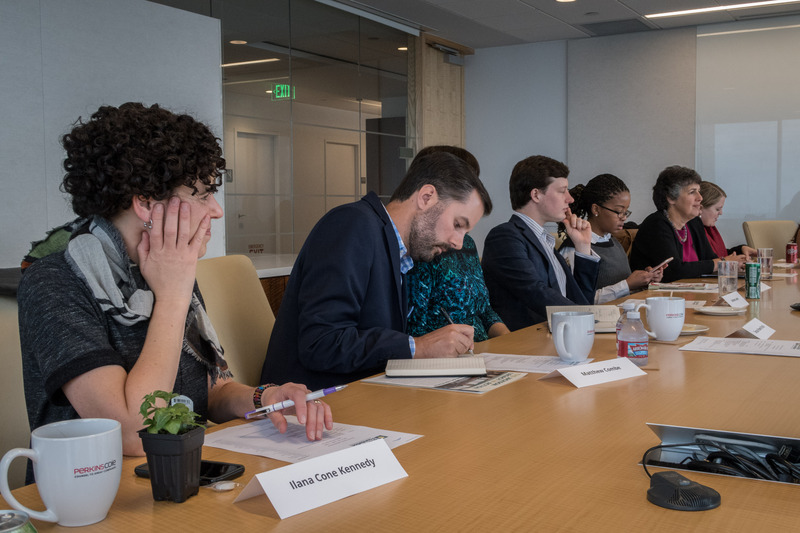 Anna Marie Jackson Laurence and I were fortunate to participate in the Holocaust Center for Humanity’s Student Leadership Board meeting last week. Anna Marie, Senator Jackson’s daughter and an officer of the Foundation, and I spoke to the group of 7th – 11th graders about Senator Jackson’s human rights legacy and achievements and why Senator Jackson was so committed to international human rights, an interest that stemmed in part from Jackson’s post-war visit to the just-liberated Buchenwald concentration camp in Germany. 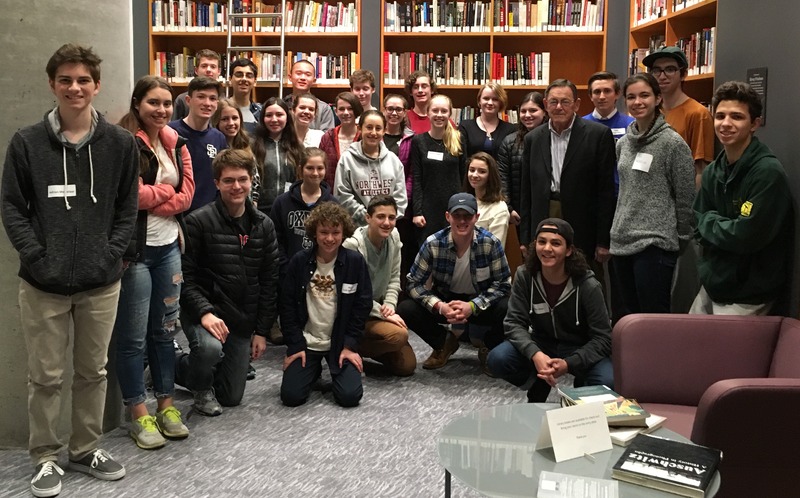 Our discussion with the young people touched on Jackson’s role in the Soviet Jewry movement and the passage of the historic Jackson-Vanik Amendment, which allowed over a million Russian Jews a to leave the USSR and other Eastern Bloc countries. We also engaged them in a conversation about leadership, distributing copies of “The Nature of Leadership,” a publication that showcases Jackson’s leadership qualities and brings them into focus for today’s younger generations. Ilana initially thought she’d create a small group experience – but couldn’t resist the thirty young people who applied to be part of the Student Leadership Board, so she accepted them all! 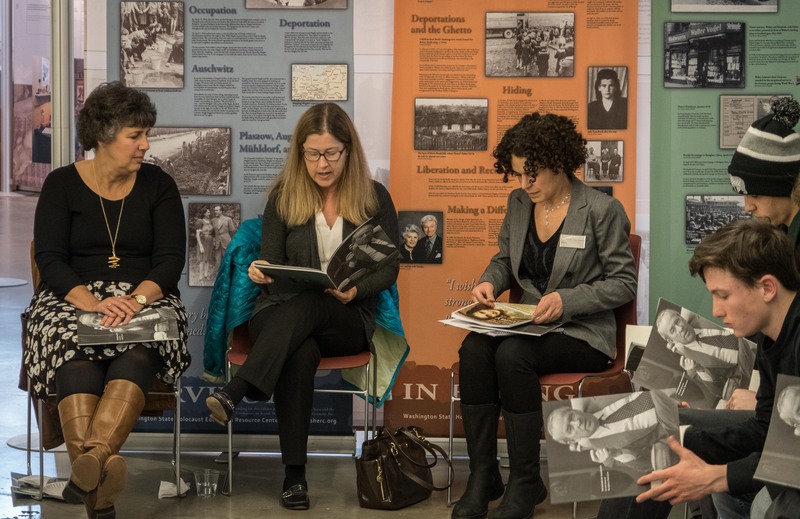 They range from 13-17 years old, but come together in their caring about the issues that the Holocaust Center focuses on – including learning more about the Holocaust, human rights, and genocide. 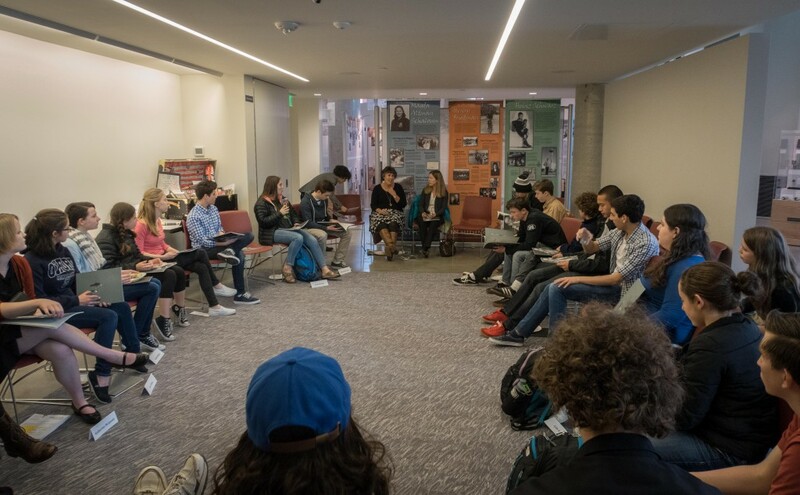 The board is meeting monthly, and students will have the opportunity to meet with community leaders, provide feedback to the Center on its programs, and serve as junior ambassadors to their schools and communities. Anna Marie and I were impressed with the scope of interests of the students – working on projects such as video promotions of the Center; data collection on the Armenian genocide; speaking to their classmates about the Center; and making posters and other graphic materials to illustrate the work of the Center for their peers. 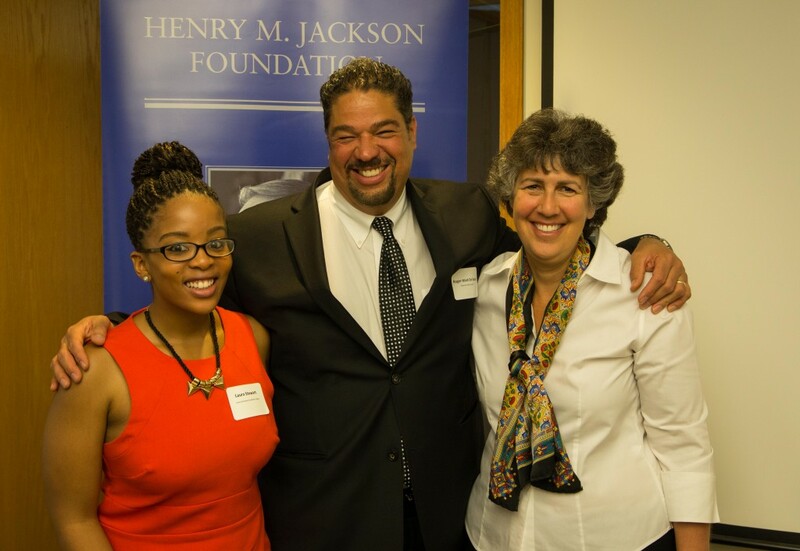 It is exciting to see that the Foundation’s work with the Jackson Leadership Fellows has begun to translate further afield, as Fellows like Ilana take what they’re learning and apply those lessons in the community. Learn more about the Holocaust Center for Humanities Student Leadership board and about all the wonderful Jackson Fellows. 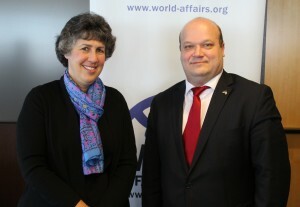 The Jackson Foundation and the World Affairs Council of Seattle convened a high-level conversation with Ambassador Valeriy Chaly, Ambassador of Ukraine to the United States before a packed room in downtown Seattle last week. I had the opportunity to moderate the session with the Ambassador, who was forthcoming about Ukraine’s challenges – both domestic and international – over the next several months. This conversation took place with the backdrop of Russia’s takeover of Ukraine’s Crimean Peninsula in March 2014, an act that provoked an unusually unified response from the U.S. and its European allies in the form of sanctions against Russia. Russia also has started an ongoing conflict in Eastern Ukraine that has left 10,000 Ukrainians dead and over a million more displaced from their homes. Given that Ukraine is facing enormous economic hardship and financial crisis in the midst of the ongoing conflict in Eastern Ukraine, the Ambassador was particularly appreciative of recent, high-level meetings that he had held with U.S. officials in Washington, DC about Ukraine as well as Russia. Russia has played an aggressive, destabilizing role in current Ukraine affairs, apart from its role in bringing in arms and mercenaries to push for a separatist movement in Eastern Ukraine and the seizure of Crimea. “Ukraine was faced with the choice of two partners when it became independent from the USSR. Now the choice is only one – the United States. Russia no longer provides an opportunity for partnership,” the Ambassador said. Ambassador Chaly expressed his gratitude to the U.S. for its standing by Ukraine during this period, although he felt that the U.S. “did not have a vision as to where Ukraine fits within its foreign policy moving forward.” This perhaps reflects the complex relationship with Russia and the West, and the role Moscow can still play in negotiations with Syria in particular. Ambassador Chaly was optimistic when talking about the eventual decisions faced by European Union countries as to whether or not to continue sanctions against Russia. “The Europeans continue to be supportive of Ukraine and I fully expect them to vote to keep the sanctions in place,” he predicted, in response to a question which noted that some European leaders have seemed anxious to resolve the sanctions issue for their own economic and political benefit. “The European Union is also a critical partner to Ukraine at this moment,” he said. The conversation also touched on the recent resignation of Ukraine’s finance minister, who specifically called out what he saw as the corruption endemic to the political and economic circles at the highest levels in Ukraine. “It is not about a single person, whether he resigns or not,” Ambassador Chaly contended, noting that Ukraine has established a new anti-corruption bureau in recent days. While European and U.S. observers are alarmed over this new development, wondering what to make of Ukraine’s commitment to reform, the Ambassador was unruffled. “We have long-term goals and a long-term struggle,” he concluded. He noted that he had come to Seattle in part to meet with Boeing and Microsoft executives, and also, as a reflection of the more than 60,000 Ukrainian immigrants who currently reside in the state. 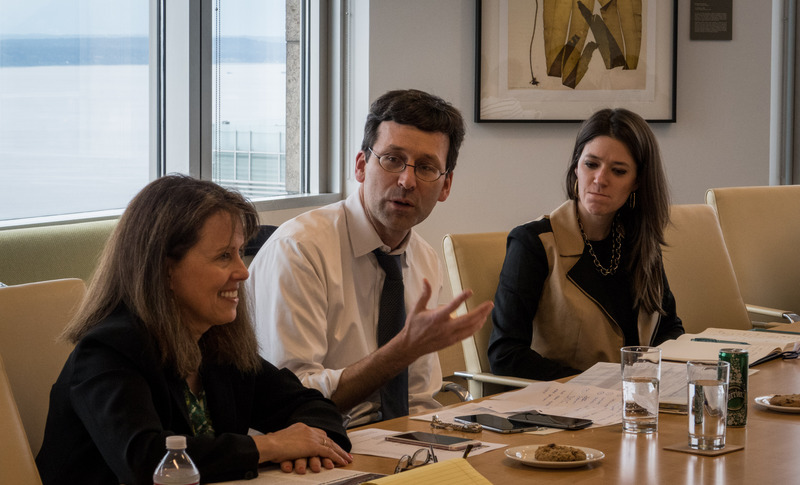 In meetings with the Seattle Mayor, a possible sister-to-sister relationship with Lviv, Ukraine and Seattle was even discussed. The interest in Ukraine was reflected in the intense audience questions which followed the formal conversation.